Looking for the perfect gift? Try a Wine Bottle Stopper! It’s the perfect pairing with a bottle of wine, and even better you can DIY your own to make it extra special. So easy and inexpensive too! We rounded up 21 of our favorite DIY Wine Bottle Stoppers to inspire you! These DIY Clay Bottle Stoppers from Wonderwood are made in 10 minutes. A practical and pretty decoration for a party table! Popcorn and chocolate shows you how to do share X’s and O’s with these sparkly XO Wine Stoppers. Perfect for Valentine’s day or sharing with someone you love. These Pumpkin Wine Stoppers from Julep take just minutes to make. A great addition to a Thanksgiving gathering! These DIY Marbled Clay Gemstone Wine Stoppers from Something Turquoise are customizable and SUPER easy to make. Create your own custom marble mix for special occasions! Unsure what to get Dad for Father’s Day? These DIY Trophy Wine Stoppers are a gift a wine loving Dad will love. Full tutorial at KJ! A Beautiful Mess uses a wood burning tool kit to make these unique DIY Wood Burned Bottle Stoppers. Perfect for dressing up a collection of beautiful decanters adorning an artfully styled bar. These DIY Drawer Knob Stoppers from Another Damn Wedding are an easy hack to making a quick and cute, homemade wine cork. 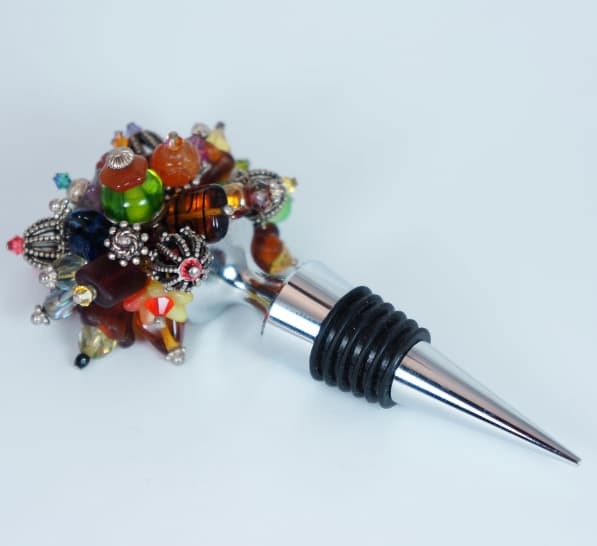 This fun DIY Wine Stopper laced in beads is sure to grab the attention of family and guests when they visit. Almost too pretty to use! Get the full DIY instructions at Bellomodo. Pull out all the stops with these Decorative Wine Stoppers. These are not only pretty and inexpensive to make, they’re practical for everyday use! Get the full tutorial video from Everyday Dishes. These easy DIY Geometric Bottle Stoppers from Freutcake fancy up unfinished wine bottles. Give them away as a unique, homemade gift or keep them for yourself! These Snowy Tree Wine Stoppers from Oh So Beautiful Paper are a fun way to celebrate the holidays. Great for holiday parties or a small hostess gift. Merlot, Pinot, Malbec all look better with a customized Bowling Trophy Wine Bottle Stopper. These toppers fit any bottle making it a breeze to transfer from bottle to bottle. Full DIY instructions at She Knows! Give your wine stoppers some bling with these DIY Jeweled Crystal Wine Stoppers from eHow in a couple simple steps. Great for housewarming and hostess gifts! < These Wooden Geometric Wine Stoppers would make the perfect Christmas present for the wine lover in your life! Get the full DIY instructions at The Merry Thought. You can cork responsibly with this Bootlegger Wine Stopper from For The Makers. Equally appropriate for intimate gatherings and holiday soirees! >Recycle old wine corks into fanciful Pint Sized Holiday Tree Wine Stoppers. Lovely to display, top a wine bottles, or to give as a holiday gift. Full tutorial at Simply Notable. These clever Equestrian Themed Wine Stoppers are as easy as super gluing plastic toys to corks. Fun project for the family to show off their creativity! Full instructions at Horses & Heels. Who doesn’t want a little frosting topping their wine bottle? These cute Glitter Wine Stoppers from Something Turquoise is a fun and cost effective way to show them off! Turn old door knobs into whimsical wine bottle stoppers! A great way to recycle old household products. Add some ace, pearls, shells, etc. to decorate them more. Full tutorial for the Old Door Knob Stoppers at Crafts a la Mode. We are in love with these Thread Spool Wine Corks from A Beautiful Mess. A simple and clever use of thread spools!